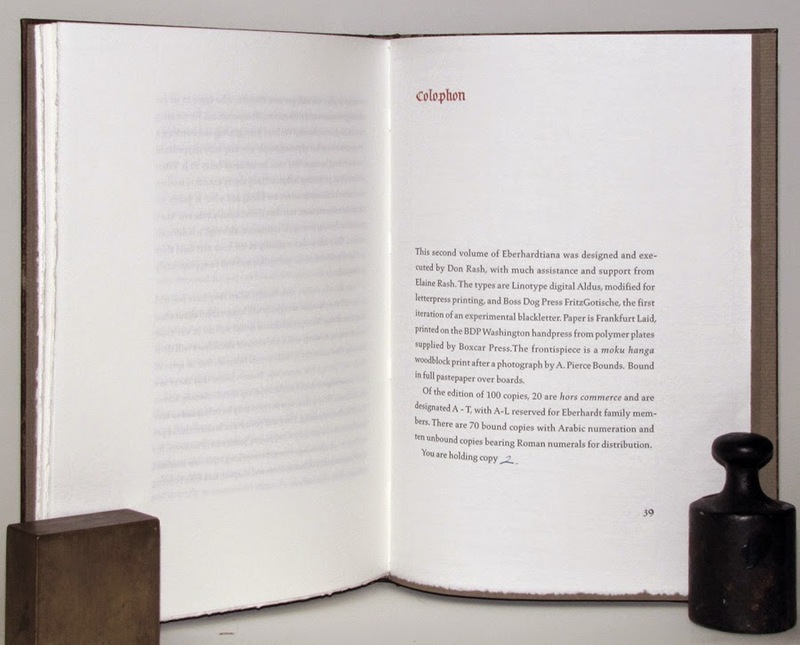 The regular edition is covered in full pastepaper with printed paper labels on spine and front board. 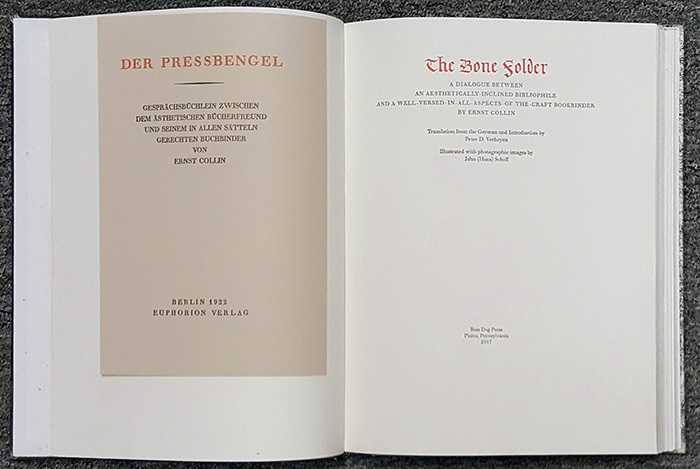 Below, the title spread from one of the copies I have bound with a facsimile of the original 1922 edition of Der Pressbengel as a frontispiece. I'm going to say that I'm floored by how beautifully these are looking - very much in keeping with an aesthetic Ernst Collin would have approved of, and enjoyed. 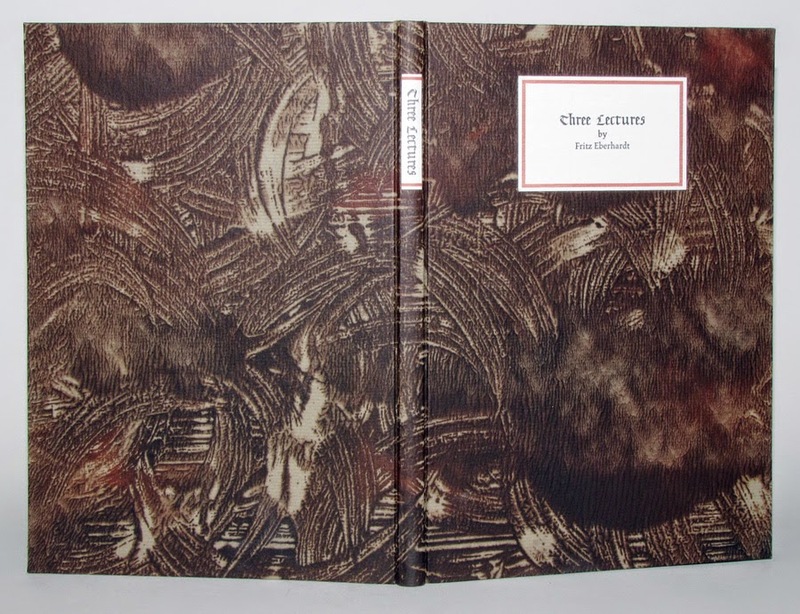 Don Rash and his Boss Dog Press have just published the second title in a series of Eberhardtiana, the first having been 2003's Rules for Bookbinders. Rules is an "unfinished poem written in German and English before Fritz's death. The stanzas were lettered so that each stanza is presented in both languages on a page, separated by a sketch by Fritz." Sold out at the press, a copy is still available at Oak Knoll Books. Three Lectures is a compilation of three lectures given by Fritz Eberhardt. The first, "On Binding" was delivered at the opening of Hand Bookbinding Today; An International Art, at Temple University in Philadelphia in 1978. The second, "Preserving the Materials of a Heritage" was given at a 1981 seminar. 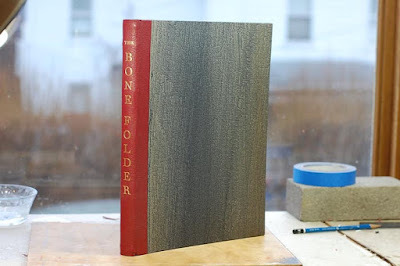 In it, Eberhardt talks about the book conservation challenges he and his wife faced after settling in the Philadelphia area in the mid-1950s. The third is "Bookbinding: The Craft, The Skill, The Trade, and The Art" given 1983 at the "Art and Craft of the Book: A Celebration" seminar held at Dickinson College. 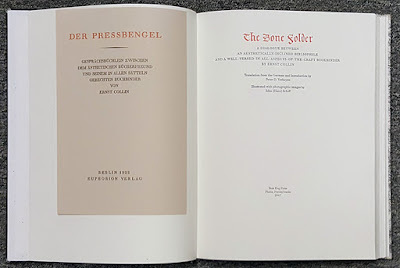 Three Lectures is printed on Frankfurt Laid paper in Linotype digital Aldus and Don Rash's own "experimental" blackletter font FritzGotische for the title and headings. The frontispiece was printed as a moku hanga woodblock print by Rash after a photograph in John & Mary's Journal by A. Pierce Bounds where the third lecture was originally published. The case binding is covered in a pastepaper with printed paper labels on spine and front board. An example of gediegene and zünftige (solid and befitting the craft/trade) bookbinding in the finest German tradition. Eberhardt, Fritz. Three Lectures. Plains, PA: Boss Dog Press, 2014. Limited to 100 numbered copies, 70 numbered and signed by Don Rash. Copies in sheets for binding may also be available from the press. Fritz Eberhardt was born in Silesia (originally part of Germany; now part of Poland) in 1917, he suffered from polio at an early age, which resulted in a permanent limp. After an apprenticeship he studied bookbinding formally under Ignatz Wiemeler at the Leipzig Academy for Graphic Arts, and calligraphy under the prodigy Rudo Spemann, and later, in Offenbach, with Hermann Zapf. Following the end of the war, he walked out of the Russian occupied zone and into West Germany. There he met his future wife, Trudi Luffert, who was also a binder. In the early 1950s the Eberhardts came to Philadelphia, where he was employed by the Library Company. Within a few years they were able to move to the farm on Old Sumneytown Pike where they would cement their reputations as two of the ﬁnest American hand binders. In addition to his binding work, Eberhardt was internationally recognized for his calligraphy. 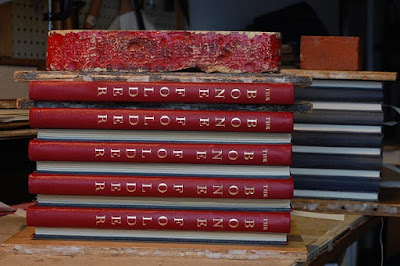 Until his death in 1998, he was a continuing voice for the artistic and cultural value of bookbinding and book works, from his early dealings with the Philadelphia book world through the debates on standards and the beginnings of institutional book arts instruction, as well as a proponent of a more professional approach for our book arts organizations. Don Rash was among his most accomplished students. [From the Guild of Book Workers 100th Anniversary Exhibition Retrospective] Depicted is his binding on Felix Timmermans, Pieter Bruegel, 1950, featuring his signature hand-cut finishing tools. 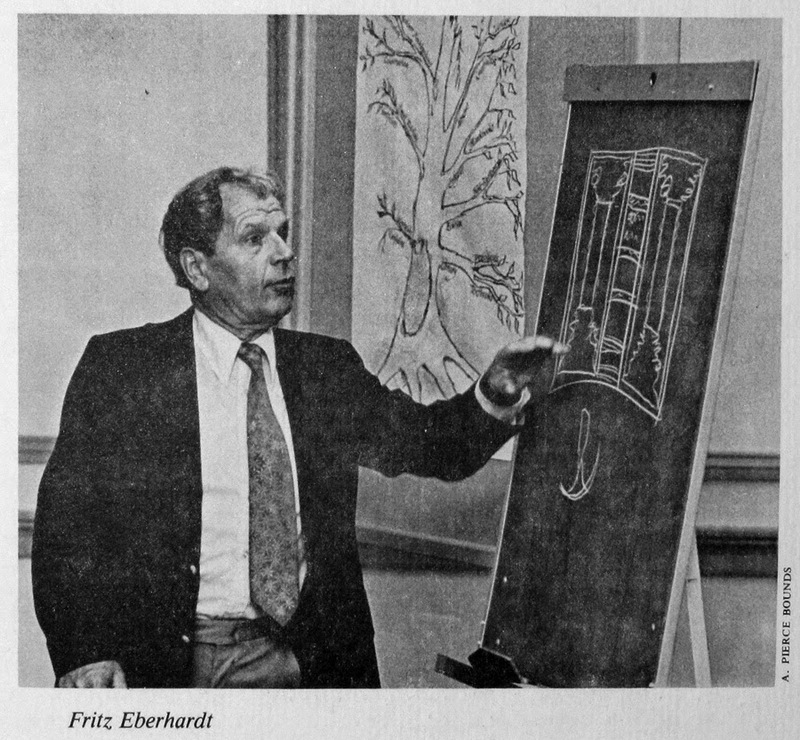 Eberhardt was also the focus of an oral history recorded in 1993 by archivist Valerie Metzger that was published in the Guild of Book Workers' Journal, volume XXXVII, number 2, Fall 2002. This article is a must-read for those interested in the work of Eberhardt and the traditions and circumstances of bookbinding in Germany during the 1930s and 40s, but also for those working in the book arts. The introduction shared via the Guild listserv can be read here. 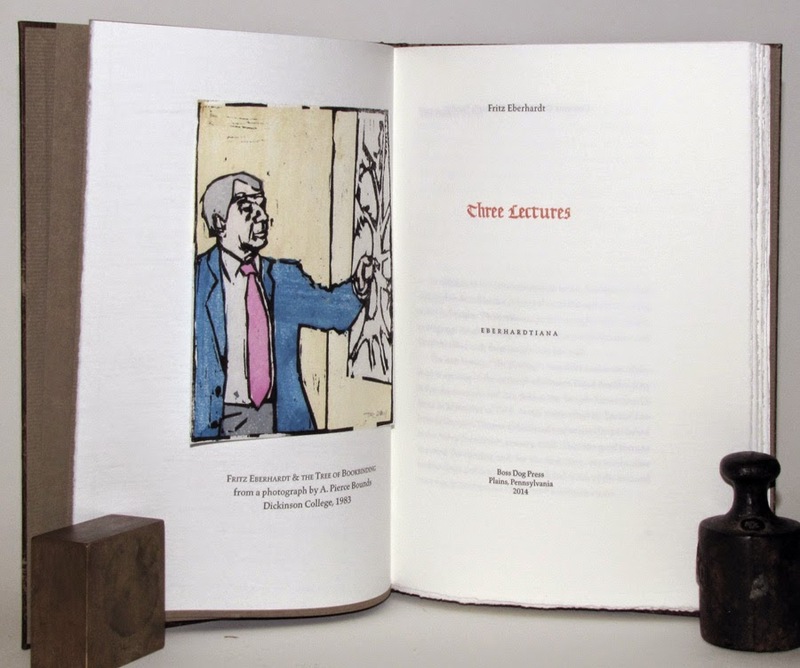 Eberhardt was also the focus of an illustrated article "Binds That Time: Homage to a Master Bookbinder" by Tony Haverstick, published in the June 1998 (vol 3, nr. 6) issue of the now defunct Biblio magazine. Here a link to his obituary from the Abbey Newsletter at CoOL. Don Rash's Eberhardtiana series pays very fitting homage to his Meister, and mentor, Fritz Eberhardt. 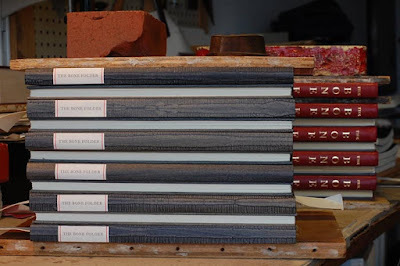 These lectures are as relevant today as when they were given over 30 years ago, and touch on all aspects of the life of private practice bookbinders, book artists, and conservators. Help [Hübel & Denck] Advertise!